This one is rather easy for me: Geoff Johns. 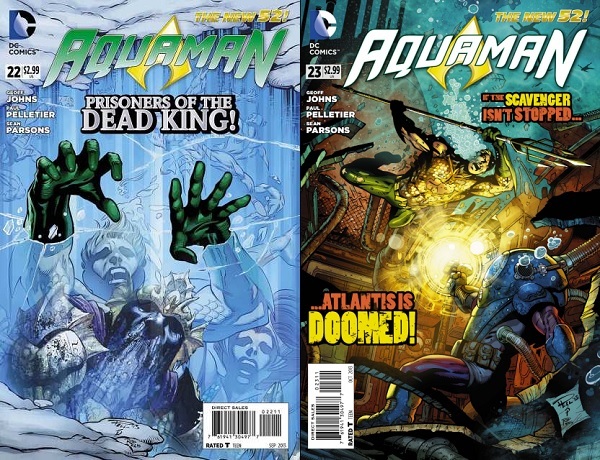 I started off reading his Justice League series for the relaunched DC Universe, the New 52, and I soon moved on to reading Aquaman which made me fall in love with the character completely. And this is from someone who didn’t really care much about him before. Since then I’ve also read his Green Lantern relaunched series and this year I went back and started to read his entire run on Green Lantern since he took on the series starting with Green Lantern: Rebirth in 2005. Its been a hell of a ride for sure. He is easily one of the best writers in the industry right now as far as I’m concerned. This is extremely tough. There are too many comics I’m reading right now that I would put in this category. So what I’m going to do here is a top four for this. It is slightly easier to do, although not by much. And just keep in mind that there are far too many series to list here, so I’m just randomly picking four. In terms of completely redefining an existing character that I’ve grown up following, that would be Scott Snyder’s Batman with the definitive artwork from Greg Capullo which has been nothing short of awesome. I hadn’t really read any Batman comics before Scott’s New 52 relaunch, so that contributed to my love for this series no doubt, but still, he made me into a die-hard fan. And a big part of this was also that he gave Batman some really iconic villains in the form of the Court of Owls and in general, Batman himself. Such a great take on the character. In terms of getting me try out something completely outside of my reading comfort zone, I’d say that would be Anthony Del Col and Conor McCreery’s Kill Shakespeare. This fantasy take on Shakespeare’s plays, where all his most notable character exist in a single world and are in conflict, was one of my best and most favourite reads last year. In terms of exploring a character I’m familiar with a blockbuster movie and making me want to read more about him, I’d say that is where Jason Aaron’s ongoing Thor: God of Thunder falls in. It is a mind-blowing mix of space opera and fantasy and is told through the perspective of three different Thors: Thor the God (of the Viking Age), Thor the Avenger (the present), and King Thor (the future, where he is the only surviving Asgardian). It is a brilliant, brilliant series that I really recommend. The first year has been just incredible. And Esad Ribic has been magnificent as an artist on this book. Such a great look that totally fits in with the tone and themes of Aaron’s scripts. Finally, in terms of just pure unadulterated fun and longevity, I’d say that Larry Hama’s G.I.Joe: A Real American Hero takes the cake. An original 155-issue run, succeeded by the IDW reboots, which have been immense fun as well, what I’ve read of those new issues. I grew up playing with G.I.Joe toys and watching the cartoon, so the franchise holds a very special place in my memories. The first would be Gail Simone’s Red Sonja reboot for Dynamite Entertainment. Across two issues so far, it has been a very different series than what I was expecting, and I’m really looking forward to the direction that Gail Simone will take the series further. I’ve read several Red Sonja books before and Gail’s book has a much different and much more enjoyable feel to it. And the art by Walter Geovani has been just mind-blowing. I loved his work on Ron Marz’s Prophecy mini-series and he is just as great here. 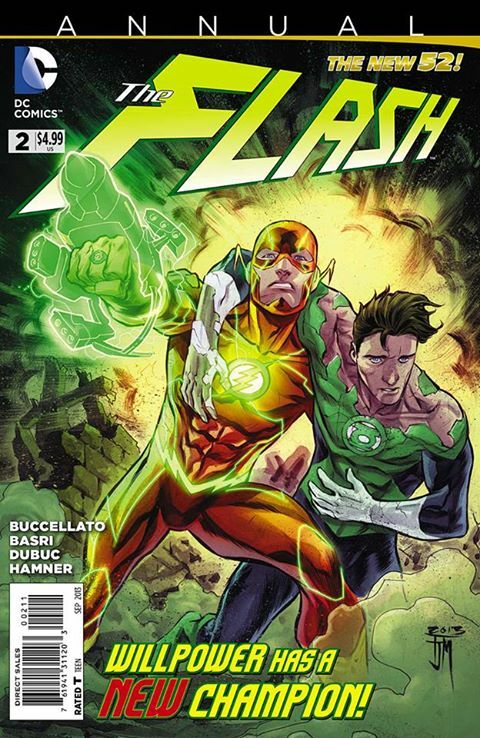 Second would be The Flash by Francis Manapul and Brian Buccellato. I read the first three issues last year but didn’t take to them. But then I read the second annual for the series, which came out in July and I was hooked. I immediately read all the issues from the current arc involving the Speed Force killer that are available, and I’ve been even more hooked. The distinctive art by these two is also one of my favourite elements of this series. Third would be Saga by Brian K. Vaughan, which really was a surprise hit for me. It tells a really fantastic space opera take with a fantasy bent to it. I never expected I’d be able to take to something like this, with all the quirks that Brian and artist Fiona Staples have infused this series with, and so this is definitely among my favourites. I’ve so far moved through half of the second arc, with three more issues to go, and then the first couple issues of the third arc. Same as last time. I don’t really drink anything while reading. Quite rare for me. If comixology was available on Emirati Apple IDs, then I’d be able to read comics on my iPad without any problems. As it is, I do most of my reading in digital format, and that too on the computer, which can get frustrating at times. Still, I try and read in print whenever I can. I’ve been collecting some graphic novels/trades for a while now, and even buying some comics in print that I really enjoy in digital, such as Justice League, Batgirl, Red Sonja, The Movement etc. Long shot this one, a long, long shot, but can I just say Barbara Gordon (Batgirl) here? Or maybe even Courtney Whitmore (Stargirl). Or Jubilation Lee (Jubilee). Or Kitty Pryde (Shadowcat). All four are among my favourite “young” heroes in comics and I’m a fan of all of them. 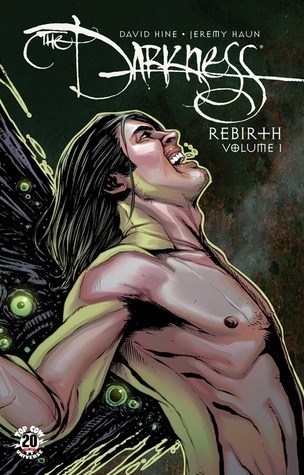 The Darkness, with David Hine’s Rebirth storyline which follows on from Ron Marz’s Artifacts maxi-series. I had absolutely no idea what this comic would be and I went in blind. And I was amazed with the first volume. I currently have the second volume, waiting to be read, and I really am looking forward to reading this. Of course, all that creepy horror art from Jeremy Haun (pencils/inks), John Rauch (colours) and Troy Peteri (letters) has also helped me to get into this series. Red Lanterns by Peter Milligan, most assuredly. I had no idea who the Red Lanterns were at the time and I wanted to try something without “Green Lantern” in its name. So I picked up this series, read the first two issues, then two more, then four more, and soon I’d read all fifteen issues by October last year. I’ve not read anything since, mostly because I’ve been a bit busy with other titles, but I’m definitely going to be getting back into this one, and soon. The series has seen a lot of rotation of artists all around, with mainliners Ed Benes, Andres Guinaldo with Jorge Jimenez, Miguel Sepulveda and others coming and going. The art has been inconsistent, but not terribly so. I think that this important moment would be when I wrote about Gail Simone being unceremoniously fired from Batgirl (post) in December last year, without rhyme or reason. I’d never written an editorial-style post on comics before, and I quite surprised myself with it. Now, I write a fair bit more, with commentary on certain aspects of the industry, as and when I can. Its very rewarding to be able to articulate some of these thoughts. Magdalena Volume 2 by Ron Marz, with art from Nelson Blake, David Marquez, Sal Regla, Dave McCaig and Troy Peteri. This is the third iteration of the character and I went in knowing only the bare basics behind the character, mostly what I picked up in Ron’s Artifacts. And I loved it. I read the two volumes back to back, because the story and the art were just that damn good. Paranormal Romance. Erotica. That’s where I draw the line. Hmmm, this one I have to think about. This would be either Geoff Johns’ epic Blackest Night or the H’el on Earth graphic novel (read as single issues) written by Scott Lobdell, Mike Johnson and Tom DeFalco and told across Superman, Supergirl and Superboy. This is a really tough one for me, as with most of the other questions in this survey. There are so many artists that I just love right now, and they are all working on so many different things. Who do I pick really? Sean Murphy because of his incredible work on The Wake with Scott Snyder? 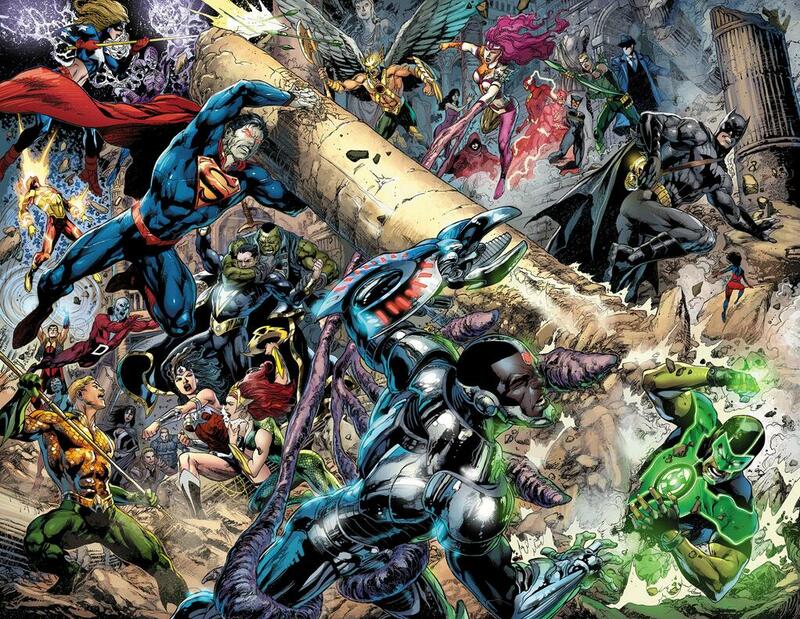 Ivan Reis and Joe Prado for everything they did with Justice League and Aquaman? Greg Capullo for the gothic splendour in Scott Snyder’s Batman? Jonathan Glapion for Batgirl? Walter Geovani for Prophecy and Red Sonja? Stjepan Sejic defining the visual beauty of the Top Cow universe for the last few years? There are honestly far too many awesome artists for me to list. Each of them does things differently and brings their own brand of uniqueness to their books. I can’t choose here. Writers are far easier to pick! Well… no shelves/cases for these really. All my graphic novels/trades lie unorganised on my shelves. Although, I make a point to keep my monthlies in a shopping bag out of convenience since I can’t exactly stack them on a shelf like I can do with novels. 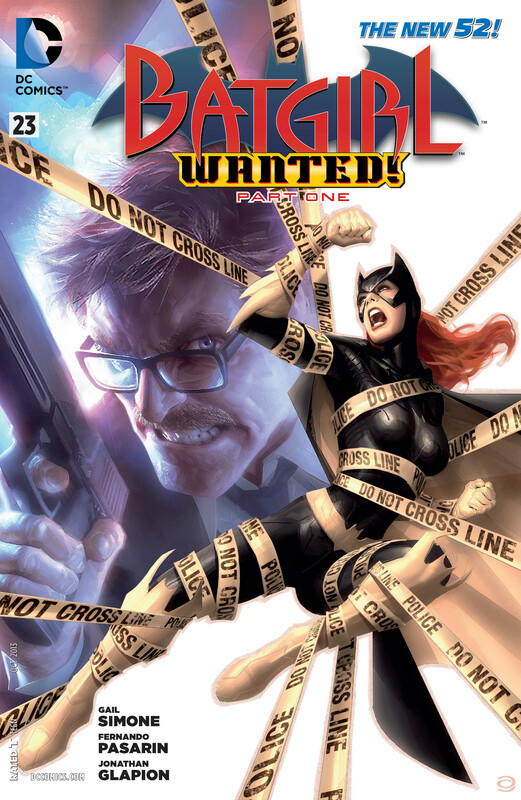 In recent times, that would be Batgirl #23 by Gail Simone (review). I read it… like what… four times back to back as soon as it was available on comixology and then twice again while I wrote my review that night. On my computer table since I mostly read digital comics on my laptop. “I am the master of all I see. I am a force of nature. I am without peer. Who am I? I am a contradiction.” Also Grodd, although only the first sentence there is a dialogue. Subjecting myself to H’el on Earth just so I could catch up to Michael Alan Nelson’s issues on Supergirl, where he takes over from #20. Well, Geoff Johns’ pre-New 52 Green Lantern run from 2005 on obviously. I estimate I’ve read about a third of it by now. Still got a lot, lot more to go. Or even the Death and Return of Superman event, of which I’ve only read the first volume, Doomsday (review), and need to read the other three. And there’s even the Batman: Knightfall saga, of which I’ve read the first volume of the first arc, Knightfall: Broken Bat (review). You see my problem? I can’t resist all these grand epics. They take so much damn time to read but I just can’t resist! Anything written by Gail Simone. She’s awesome. I love her. James Robinson has just been announced as the writer for a new Marvel book coming next year, All-New Invaders and I’m really looking forward to this because I think James is a fantastic writer. Procrastination with reading some comics that I really, really should be reading. I’ve only brought two graphic novels with me to India at the moment, and I don’t have any monthlies with me, so can’t really answer this. However, the 5th comic on my list of new releases to read on comixology is Batman: Black & White #1, which is an anthology issue. Well, I bought a whole bunch of new DC releases this past Wednesday, and some other titles. 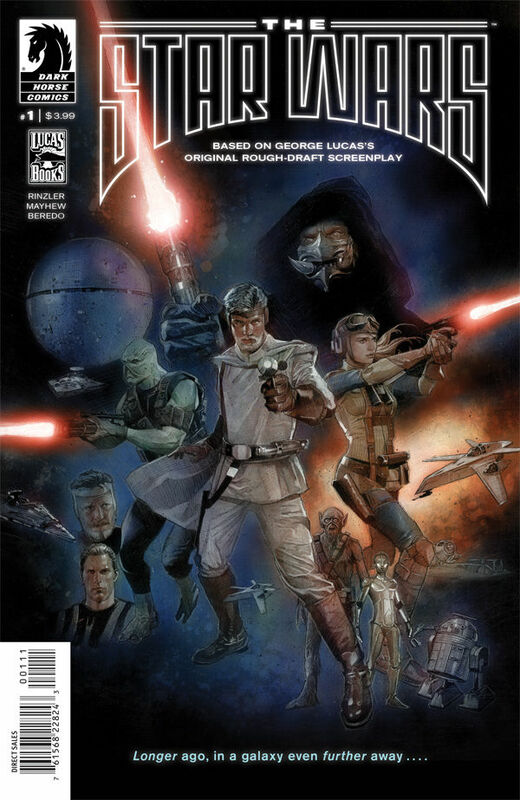 The most recent of these is The Star Wars #1, written by J. W. Rinzler, with art my Mike Mayhew, colours by Rain Beredo and lettering by Michael Heisler. I read it last night and I was blown away. This is based on Lucas’ original 1974 script for Star Wars and is markedly different from the Star Wars that he ultimately filmed and released later that decade. I definitely recommend reading it! Well… I often go to bed while reading comics. Can be anything really since monthlies take all of 10mins to read, at most. Posted on September 10, 2013, in Editorial, General and tagged Anthony Del Col, Aquaman, Artifacts, Barry Allen, Batgirl, Batman: Knightfall, Blackest Night, Brian Buccellato, Brian K. Vaughan, Comedy, Comics, Conor McCreery, Courtney Whitmore, Dark Horse Comics, David Hine, DC Comics, Death and Return of Superman, Dynamite Entertainment, Ed Benes, Esad Ribic, Espionage, Fantasy, Fiona Staples, Francis Manapul, G.I.Joe, G.I.Joe: A Real American Hero, Gail Simone, Geoff Johns, Gorilla Grodd, Green Lantern, Greg Capullo, Grodd, H'el on Earth, Horror, Image Comics, Ivan Reis, J. W. Rinzler, Joe Prado, Jonathan Glapion, Jubilee, Justice League, Kill Shakespeare, Kitty Pryde, Larry Hama, Magdalena, Marvel, Marvel Now, Mutants, Nelson Blake III, New 52, Peter Milligan, Red Lanterns, Red Sonja, Ron Marz, Saga, Science Fiction, Scott Snyder, Sean Murphy, Shadowcat, Space Opera, Stargirl, Stjepan Sejic, Superboy, Supergirl, Superheroes, Superman, The Darkness, The Flash, The Movement, The Star Wars, Thor, Thor: God of Thunder, Top Cow, Trinity War, Urban Action, Walter Geovani, X-Men. Bookmark the permalink. 4 Comments.